or Content Integration Using Folder viewer in Webcenter Portal . contentserver- is connection name to the UCM. content id = is the content id of the document. Happy Learning by Vinay in techartifact…. Requirement -provide detailed step-by-step procedure for preparing your system for the installation of Oracle WebCenter 11g and Oracle UCM 11g on 64-bit Linux environment. Before starting the installation, the software bundles of the following products need to be available. Log in as the ‘root’ user. Create a Group (each for WebCenter and UCM installations) and an User (each for WebCenter and UCM installations). Assign the appropriate User to the respective Groups for the WebCenter and UCM installations. Here, Replace <User> in the above mentioned lines with the WebCenter or UCM installation user. 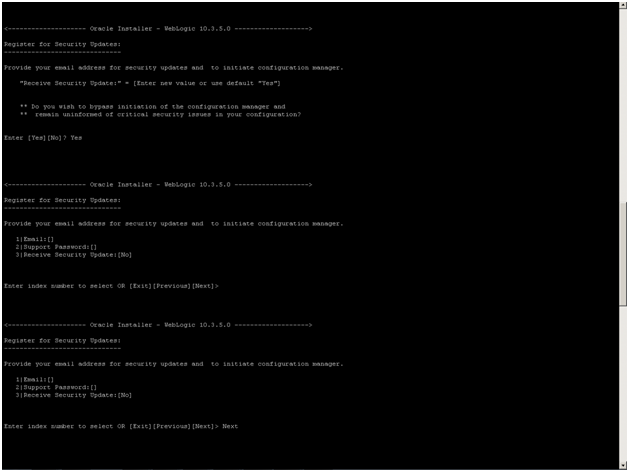 Log in as the ‘WebCenter or UCM installation’ user. Make sure /tmp directory is writable and has atleast 60 MB of disk space for WebCenter and UCM installation. The following sub-sections elaborate the installation details for each of the above steps. WebCenter Portal and UCM require that certain schemas exist in the database prior to installation. 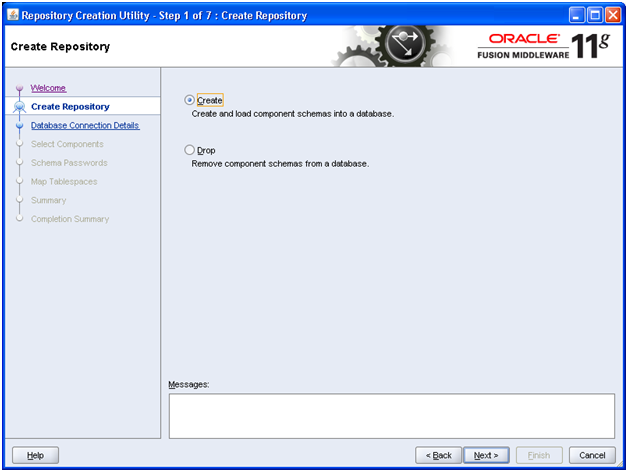 You must run Repository Creation Utility (RCU) to create the schemas in the database. 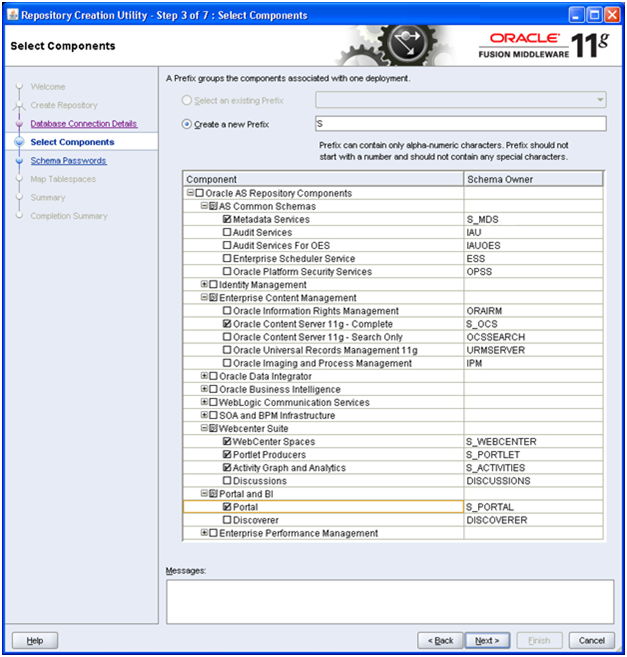 You must create an Oracle Database Instance (11g Release 1 or 2). All the below required DB parameters need to be updated and these are only specific to RCU. Execute the below given SQL query using TOAD Editor/SQL Plus before you run the RCU installation. Unzip the RCU installable file to a directory (Say, rcuHome). Navigate to /rcuHome/bin directory and open a terminal window. The RCU Welcome Screen appears. Select ‘Create’ to create component schemas in the database. 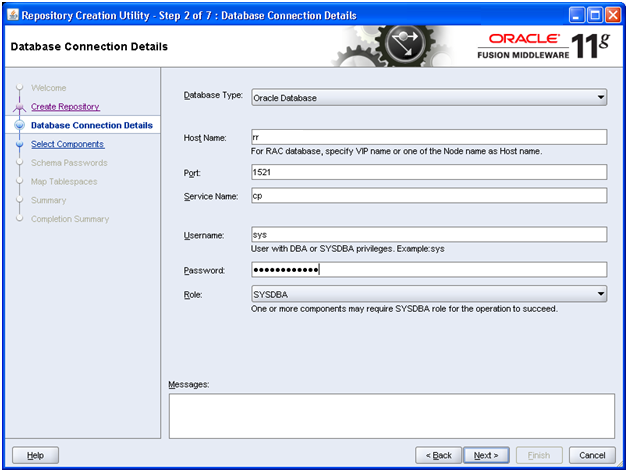 The Checking Prerequisites Screen appears, indicating the progress of the installer establishing the connection with the specified database. When the operation completes, click OK. Specify a schema prefix and select the components for which you want to create schemas in the database. The default new prefix is ‘DEV’. If you want to create a new prefix for your schemas, select ‘Create a New Prefix’ and specify a new prefix name in the field. (E.g. S). Select the following components (marked in bold). The components are selected here as per the project requirement. After you select the components you want to install, click Next to continue. The Checking Prerequisites Screen appears, indicating the progress of the component pre-requisites check for creating schemas. Specify the passwords for your schema owners. 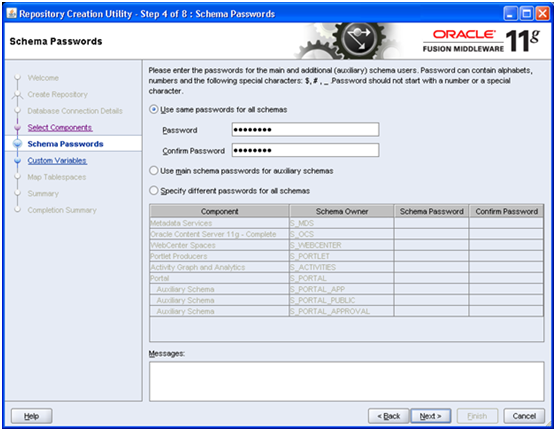 Select ‘Use same passwords for all schemas’ to use a single password for all schemas and their auxiliary schemas. This option is selected by default. Enter the password and confirm password again. 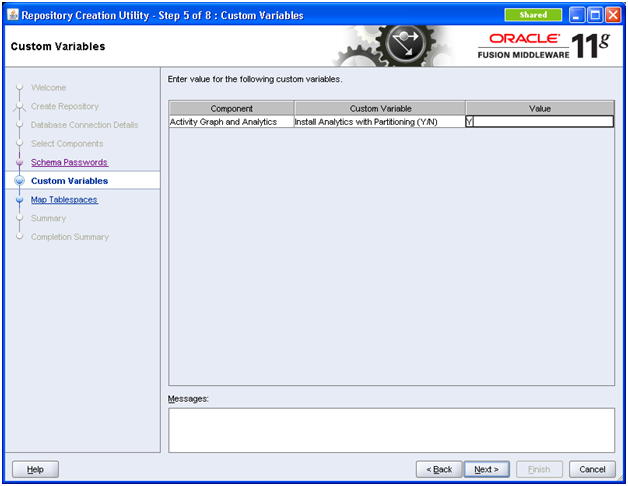 The Custom Variables Screen appears only if you selected a component on the Select Components Screen (for Create Operation) that supports custom variables, required by the components during runtime. The Map Tablespaces Screen appears. 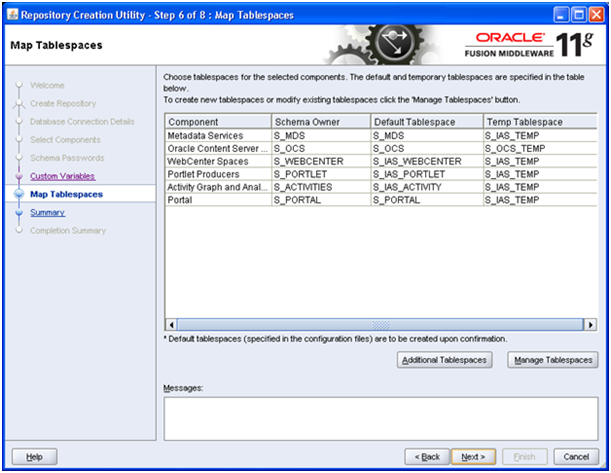 In this installation, you accept the default and temporary tablespaces for the selected components. 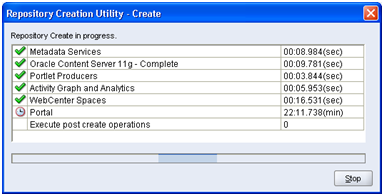 The Creating Tablespaces Screen appears, indicating the progress of the tablespaces creation. Review the Summary Screen and verify the details of component schemas that will be created in the database. Click Create to begin schema creation. The schemas are being created. 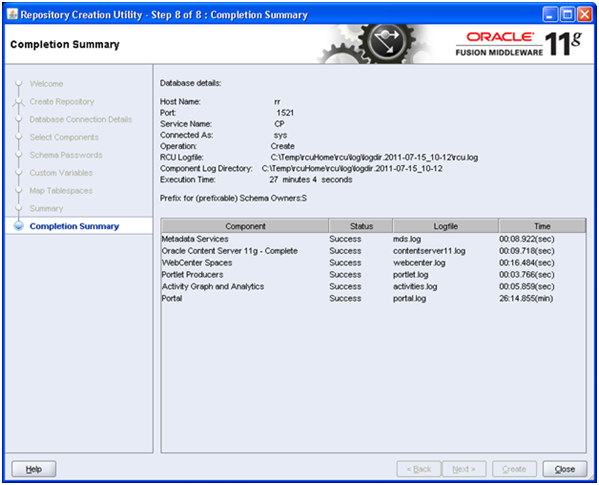 The Completion Summary Screen appears, indicating the successful creation of schemas for Oracle WebCenter 11g and Oracle UCM 11g. The JDK must be installed on your system before you install Oracle WebLogic Server. It is recommended that you use the Sun JDK if you are installing in a development environment. Typically, this environment provides a more relaxed security configuration and enables you to auto-deploy applications. In a development environment, boot.properties is used for user names and passwords and polling is used for application deployment. If you are installing in a production environment, it is recommended that you use the Oracle JRockit JDK. Production environments are for applications running in their final form. Full security is enabled and applications may be clustered or use other advanced features. In this mode, user names and passwords are required and polling is not used for application deployment. Navigate to the directory where you want to install the software. (Say, /usr/local/apps). In this installation, Sun JDK installable file is placed at the same location where you want to install the software. You will be prompted to ‘Press Enter to continue’. Press ‘Enter’ to complete the installation. 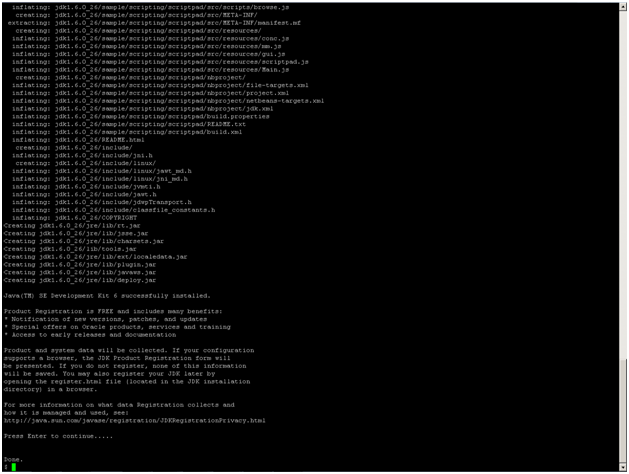 In this installation, Sun JDK is installed in the /usr/local/apps/jdk1.6.0_26 directory. 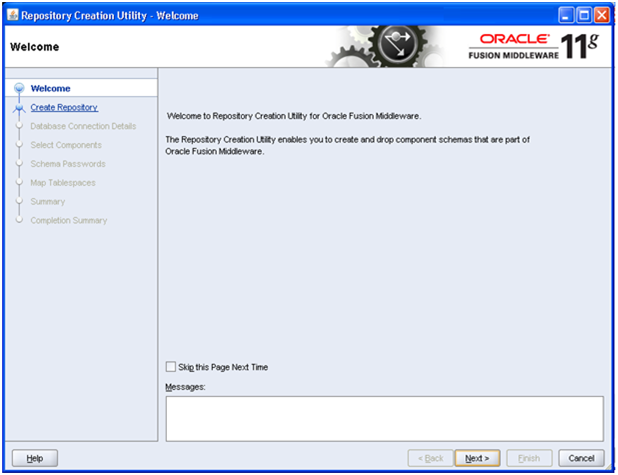 WebCenter and UCM runs on Oracle WebLogic Server 11g. You must install Oracle WebLogic Server before you install WebCenter and UCM. 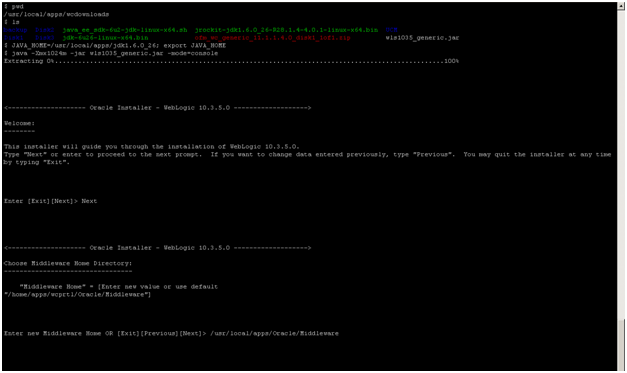 If you do not already have one, follow the instructions in this section to install Oracle WebLogic Server. Exit – to exit from the installation procedure in response to any prompt. Previous – to review or change the selection. When you see a right arrow (->) associated to a choice on the screen during the installation process, it depicts that the corresponding choice is selected by default by the installer. Type Next and press Enter to accept the default selection (or) enter the number associated with the choice for selecting the option of your choice. When you see a cross symbol (x) associated to a choice on the screen during the installation process, it depicts that the corresponding choice is selected by default by the installer. Type Next and press Enter to accept the default selection (or) type the number that appears inside the [ ] brackets and press Enter to deselect the default selection (or) enter the number associated with the choice for selecting the option of your choice. Here, JAVA_HOME is the installation location of the supported JDK you installed for your platform. 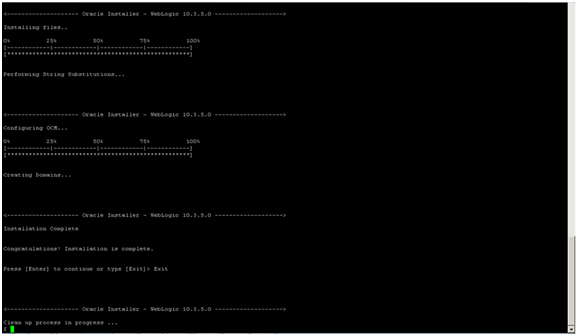 The wls1035_generic.jar file is extracted and the installation process begins. At the Welcome prompt, type Next, or press Enter to continue with the installation process. The Choose Middleware Home Directory prompt is displayed. Specify the desired location of your new Middleware Home directory. Type the new Middleware Home. 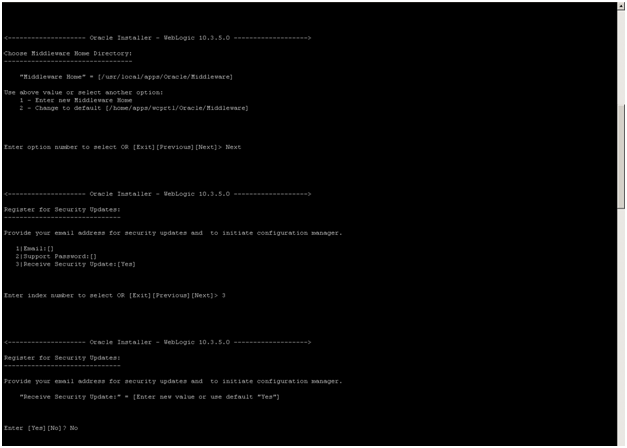 Say, ‘/usr/local/apps/Oracle/Middleware’ and press Enter to continue. The chosen Middleware Home directory is displayed. Type Next and press Enter to continue. The Register for Security Updates prompt is displayed. Select whether or not you want to receive the latest product and security updates. If you do not wish to receive security updates and to initiate configuration manager, type 3 and press Enter to continue. Type No and press Enter to confirm your selection. If you choose not to receive anything, you will be asked to verify your selection before continuing. Type Yes and press Enter to confirm your selection. Type Next and press Enter to proceed with the installation process. The Choose Install Type prompt is displayed. The Typical installation type is selected by default. In this installation, you must select the Custom installation type to select the products and components you want to install. Type 2 and press Enter to continue. The Choose Products and Components prompt is displayed. You will be prompted to select the products and the components from the list that you want to install as shown in the screenshot below. Type the number exactly as it appears in brackets adjacent to the products and the components. In this installation (as per the project requirement), de-select Evaluation Database component (that belongs to the WebLogic Server Product) and de-select Oracle Coherence product and its components. The de-selection of the products and the components for this installation is illustrated in the below steps with necessary screenshots. Type 1.12 and press Enter to de-select the Evaluation Database component. 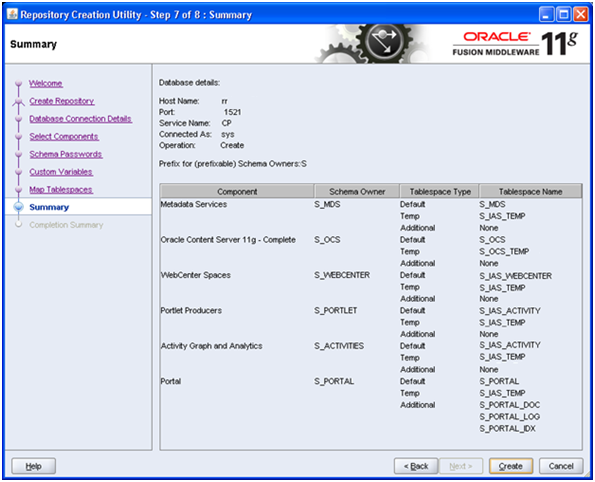 Type 2 and press Enter to de-select the Oracle Coherence product and its components. After you select the products and the components you want to install, type Next and press Enter to continue. The JDK Selection prompt is displayed. Select the JDKs you want to install. Type 1 and press Enter to add the local JDK (SUN JDK 1.6.0) that you installed on your system. If you notice to see open JDK (/usr/lib/jvm/java-1.6.0-openjdk-1.6.0.0.x86_64) is selected by default by the installer on this screen (as shown in the screenshot below). You must de-select the open JDK once the process of adding local JDK is done to proceed with the installation process. It is recommended that you use the Sun JDK if you are installing in a development environment and if you are installing in a production environment, it is recommended that you use the Oracle JRockit JDK. The 32-bit WebLogic executable files are bundled with the appropriate JDK version. If you use the 64-bit WebLogic installer, you will need to invoke the installer with a supported JDK for your platform. Type the new Local Java Home. Say ‘/usr/local/apps/jdk1.6.0_26’ and press Enter to continue. JAVA_HOME is the installation location of the supported JDK you installed for your platform. Type Next and press Enter to confirm your selection. The chosen Local JDK is displayed. The open JDK is selected by default by the installer as shown in the screenshot below. You must de-select the open JDK to proceed with the installation process. Type 2 and press Enter to de-select the open JDK selection. The open JDK is de-selected as shown in the screenshot below. Type Next and press Enter to continue. The Choose Product Installation Directories prompt is displayed. The chosen Middleware Home directory is displayed as shown in the screenshot below. Review and verify the list of products and the components that will be installed. The installation process begins. Progress bar shows the % installation of the component. Once the installation is complete the following message is displayed, ‘Congratulations! Installation is complete’. Type Exit and press Enter to exit the installation process.